Last year, at least 74 drivers were not at fault in the deaths of the pedestrians they struck with their vehicles, according to Schneider’s data. That number could be even higher, Schneider said. Many drivers who were issued citations could have been found in violation of something menial, such as an expired inspection sticker, and not at fault in the death of the pedestrian they hit. “Most pedestrian fatalities are the pedestrian’s fault for stepping in front of the car,” Schneider said. Alcohol impairment and suicide are generally considered the two likeliest reasons a pedestrian might end up in the path of a moving car, said Russell Graham, a spokesman for the State Police. 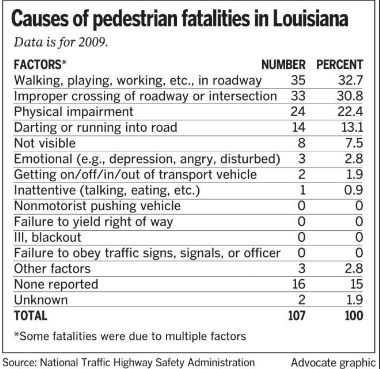 Twenty-four of the 107 pedestrians killed in Louisiana in 2009 were found to have been drunk or otherwise “impaired”; 33 had been “improperly crossing” the roadway; and 14 had “darted or run” into the road, according to the National Highway Traffic Safety Administration. Darkness does not help. In Louisiana, a fatal pedestrian accident is four times more likely to occur during the hours of 6 p.m. to 6 a.m. than during daylight hours, the NHTSA data shows. The innocent drivers often feel overwhelmed both with guilt and anger directed at the pedestrian for having put themselves in harm’s way, said Kathy Vilas, director of the Baton Rouge Grief Recovery Center. Graham said that troopers who respond to these types of accidents are troubled by the fact that no one will ever know if the pedestrian intentionally jumped in front of the vehicle. Those uncertainties haunt both the drivers and the families of the deceased. Darwin Carson had seemed mentally “OK” just three days before the accident when his grandmother spoke to him, she said. A carpenter by trade, Darwin Carson had planned to move to Birmingham, Ala., to find work repairing homes damaged in the recent tornados, she said. For the drivers, those unknown variables surrounding the accident’s cause can be equally heartbreaking, Vilas said. Julius Mire of Baton Rouge was 67 in 2005 when a Pontchatoula man stepped in front of his Toyota sedan on Interstate 12 about 10 p.m. Mire was not at fault in the man’s death, police said at the time. Now Mire, a retired Conoco Oil Co. worker, said he has learned to cope with the daily memory of hitting and killing the 63-year-old man seven years ago. Cowell said he kept replaying those fateful seconds over and over in his head — he was driving 45 miles per hour at about 7 p.m., winding down La. 16 in Denham Springs — each time trying to imagine a way to avoid killing the man in the middle of the road. “Part of that was trying to think if there were any way with the actions he took, if I had swerved to the left, maybe I could’ve missed him,” he said. Cowell said he thought the man he killed had been trying to commit suicide because he had actively crawled on his hands and knees, and at the last second, dove into the path of his truck. State troopers found evidence at the scene to corroborate Cowell’s account, Graham said. That night, Cowell said, the troopers told him that dust on his bumper was left undisturbed, indicating the man had been lying flat at the moment of impact. Cowell said he prayed the man he killed was now in a better place. “I hate the way this sounds, but it’s the best way I can say it: nobody in their right mind would take the actions he took,” Cowell said. Cowell’s wife of 23 years, Danna, said she had hardly ever seen him cry before the accident. “Now, he’ll just be walking through the house, or doing the dishes, and just break down crying,” Danna Cowell said. To Cowell and other innocent drivers like him, Mire offered encouragement. “It does get better with time,” he said. Vilas agreed, saying that the first year is generally the hardest. After that, she said, the driver will learn to manage the grief, and the flashbacks will subside. 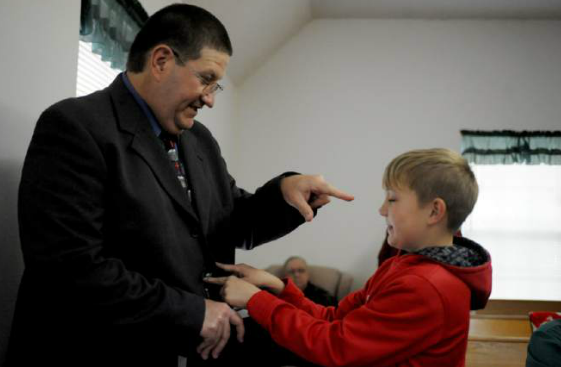 For now, Cowell is focused on spending time with his family and his True Light Baptist Church congregation, a support system he said he feels a renewed sense of gratitude to have.